Downtown grocery store, district attorney’s conviction integrity unit funding approved – Welcome to Wyandotte Daily! The Unified Government Commission tonight approved a management agreement for a downtown grocery store at 5th and Minnesota Avenue, and also approved the funding for the district attorney’s conviction integrity unit. There was no commission opposition to either of the votes. 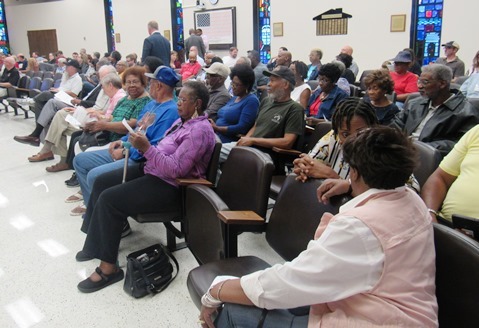 A large crowd turned out for the meeting, including some persons in favor of the two projects. The approval of the grocery store was applauded by many of those in attendance. The downtown area has been without a grocery store for a number of years. “This is a key location in our community,” Mayor David Alvey said. “I’m confident that that location, its accessibility to downtown Kansas City, Missouri, and to other parts of the metro area, is going to bring in not just our residents, but folks from outside. The $6 million downtown grocery store will be a 12,000 to 14,000-square-foot building in a current parking lot to the south of the Reardon Convention Center, and to the west of the former EPA building that will become a University of Kansas Health Systems facility, said Jon Stephens, UG economic development director. There may be additional small retail spaces at the site. The Merc, a cooperative grocery store in Lawrence, Kansas, will manage the new store, at 5th and Minnesota, according to UG officials. Under the management agreement, the UG would own the building and would manage the construction of it, UG officials said. There was a stabilization fund of $540,000 established that would provide funding in the first three years if the store fell below minimum levels. The stabilization fund would not be used if the store is operating at minimum levels that were set in the management agreement. 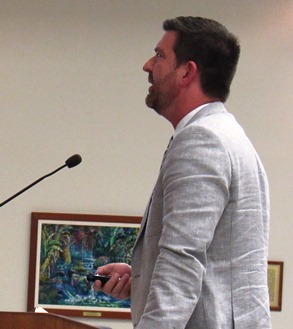 Stephens said there would be a $4.2 million UG cash contribution from the hotel revenue fund; and sales tax and property tax increment financing at $1.6 million. The funding from the hotel revenue fund was from the sale of the Hilton Garden Inn that is next to the Reardon Convention Center at 5th and Minnesota. Estimated construction costs of the grocery store building are $2.76 million, with furniture, fixtures and equipment at $1.5 million, professional services at $500,000 and project contingency funds at $500,000. He also said the building could be sold to a private entity in the future, or to The Merc, with the revenue used again for future UG developments. Stephens said it might take 12 to 16 months to build the grocery store. He estimated the store could be under construction by spring of 2019, and possibly open by fall of 2019, depending on the weather. He also said there would be an additional 110 angled parking spaces along the streets in the area, which would add to available parking. In addition, Stephens said the Board of Public Utilities will provide 100 percent renewable energy sources for the new store. Stephens said the new store will have a classroom in which cooking classes and health-related cooking classes can be offered. “We’re super excited to be a part of this project, and super excited to join the community,” said Jason Lovell, finance manager of The Merc Co-op, after the meeting. Currently The Merc has one store in Lawrence. The Merc’s board of directors a few years ago revised its end statement to provide healthy foods throughout the region, not just Lawrence, he said. They met with some members of the UG who were interested in finding a downtown grocery store operator. The stabilization fund has made a difference in this project. Lovell said The Merc is not necessarily concerned with the financial end of the project now that the UG is offering a stabilization fund with it. Lovell said The Merc is a cooperative that is owned by the community, and if it is bringing wealth to the community, that is what determines its success. He said they will welcome anyone here interested in being part of the cooperative as an owner. Stephens said the grocery store will be open to everyone, people did not have to be members to shop there, and the prices at the store would be the same for members and nonmembers. Commissioner Gayle Townsend expressed her appreciation to The Merc to come into the community and provide a much-needed grocery store here. “Once the store comes here, we want it to be our store,” she said. “This is something we’ve sought a long time, and it is going to be a much-needed, much-desired improvement, and people in KCK are going to prove that to you,” Commissioner Townsend said. Commissioner Jane Philbrook said it was fun to shop at The Merc in Lawrence because she got to look at all the pictures in the store of the people who produce the food. The store carries a lot of locally grown produce and products. Commissioner Brian McKiernan also thanked everyone for the hard work they put in on the project, and made the motion to pass the agreement. There was no public hearing at the Thursday night meeting. A public hearing was set for 7 p.m. Oct. 11 on a downtown grocery redevelopment tax increment-financing (TIF) district. Beverly Darby, who was in the audience, said she was glad the grocery store was approved. Another person attending the meeting, Shirley Ikerd, had a different opinion about the location of the grocery store. She said the people in the food desert had been short-changed. “Instead of putting it at 10th and Minnesota, they put it at 5th and Minnesota,” she said. The area near 10th and State was the former location of a Healthy Campus project for a grocery and recreation center. Ikerd said she was concerned that people who live in apartments, for example, near 9th and Washington, would not have transportation to get to the grocery store on 5th. The conviction integrity unit funding was approved Thursday night with no discussion by the commission. A community meeting was held Wednesday night at the Beatrice Lee Community Center, 10th and State Avenue, supporting the district attorney’s conviction integrity unit. At the meeting, the district attorney explained how the program worked, and there were also comments by Lamonte McIntyre, who was wrongfully incarcerated, from a University of Missouri at Kansas City law professor, by state Sen. David Haley, D-4th Dist., and others. 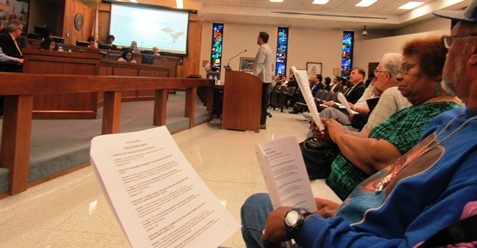 At that meeting, residents were asked to attend the Thursday night meeting in support of the CIU funding. That meeting was streamed live on Facebook at https://www.facebook.com/lacyannheartlandkirby/videos/10212532928262524/UzpfSTEwMDAwMDI5Mjk0MzM4MjozMDYwNjExMjk0OTk0MTQ6NzU6MDoxNTM1Nzg1MTk5Oi0xODE3NTk3OTA4NjUyOTMxNTUy/?id=100000292943382. At the end of July, the police chief, sheriff and members of the Fraternal Order of Police had sent a letter to the attorney general asking for his opinion on the legality of the CIU program and asking his office to oversee cases that go through it. The attorney general wrote a letter that said from his viewpoint, the CIU program appeared to be within the laws. After the Thursday night meeting, Darby said, “I’m just thankful it’s going through.” She also came to the meeting to support the funding for the conviction integrity unit. To view an earlier story on the conviction integrity unit, visit http://wyandottedaily.com/das-conviction-integrity-unit-to-come-before-ug-commission-aug-30/.